The veteran hero SuperPatriot began travelling across the United States, campaigning against the Vietnam War. It was on this mission that he met one of his many conquests, Rebecca Farrell, through her older brother Jake’s FBI contacts. 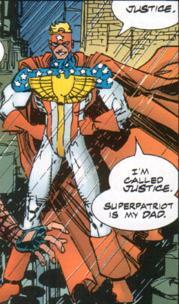 Unbeknownst to the hero, he fathered two children who were named Liberty & Justice as homage to their father. The children grew up being told of their father, but their heritage was hidden from the world so that villains do not use them as hostages. Both siblings were finally united with their heroic father while he was going after the Covenant of the Sword. Since that time, all three of the heroes have worked together to build more of a family unit. Justice and Dart became lovers after meeting during the Gang War. Kill-Cat became insanely jealous of Justice and brutally beat the young hero in a failed effort to win over Dart. The relationship eventually failed mostly due to Dart’s insecurities regarding her place amongst super-powered heroes and realizing that Justice’s immature nature frustrated her. Justice was saddened by this rejection but through himself into action as Liberty’s partner once more. Justice was found beaten and near death following a battle with the Covenant that saw the abduction of Liberty. As he slipped into a coma, Justice informed his father that his sister had been brain-washed by the Covenant and must be rescued. SuperPatriot was captured by the group and became the latest slave of the group. The Special Operations Strikeforce later questioned Justice and discovered that the Covenant were behind a series of abductions of super-powered children and villains. He was too sick to assist in the assault upon the Covenant that saw the liberation of all of the kidnapped individuals. Many years later, both Liberty & Justice were recruited by Dragon as he led an army of superheroes to rescue his adopted step-daughter, Angel, from the Vicious Circle. The sibling team was brutally murdered by Baby Killer who then turned his attention towards SuperPatriot. The grief-stricken hero avenged his offspring’s deaths by shooting the villain until there was literally nothing left of his head. When SuperPatriot and his new wife Claire Bono became parents to another set of twins, they were named Liberty and Justice after the fallen heroes.